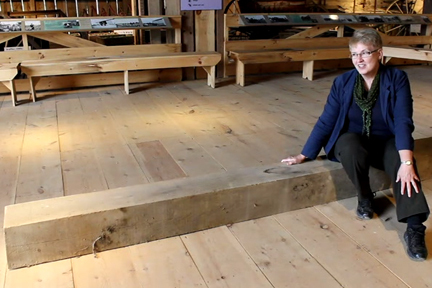 Susan Dunlop, the curator of the Wellington County Museum & Archives explains, in the videos below, where the wood came from and why it was necessary to remove part of these beams. Even though this update was done in the mid-twentieth century, nothing was thrown away. A section of the beam that Susan is sitting on in the first video was made available for a platter from this historic barn. It is interesting to note that the beams in this barn are all milled square. Most barns built in the 19th century had hand-hewn beams. The beam is shown on the right. In Susan's words, "This squared timber was part of the original framework of the House of Industry timber frame barn, built in 1877 at the same time as the Wellington County House of Industry and Refuge. The site has been the home of the Wellington County Museum and Archives since 1974. A working farm for nearly a century, the barn underwent many renovations as farming practices changed and improved. In the 1940s, a hay carrier system was installed by Beatty Bros. Ltd. of Fergus, one of the largest manufacturers of farm equipment in Canada. This enabled hay to be mechanically lifted by a pulley system to the side bays and packed high to the peak. To allow the hay slings to be swung up and across the height of the barn, the centre part of the cross timbers or tie beams was removed, each about 10 feet long x 9 x9 inches wide." The intention, when sawmilling the beam section, was to retain as much of the outside surface as possible. I wanted to make a platter with the original surface on the rim. Even though this surface was not as textured as some of the other pieces in this show, keeping the original was important. One item of note: the beam is pine. I was expecting it to be a hardwood. 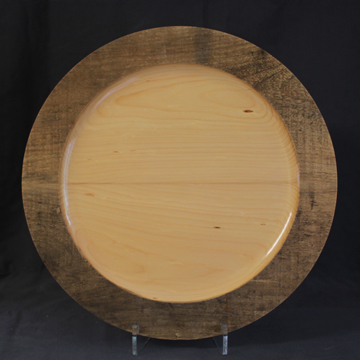 These next videos show the turning process for the platter. 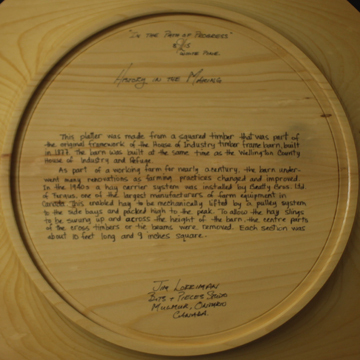 "In the Path of Progress"
A synopsis of the story of this beam is on the back of the platter. I called this piece "In the Path of Progress". It was my intention to leave the original surface on the platter rim. I had to sand it very lightly to remove the splinters but as you can see, the flavour of the exterior of the beam has remained.